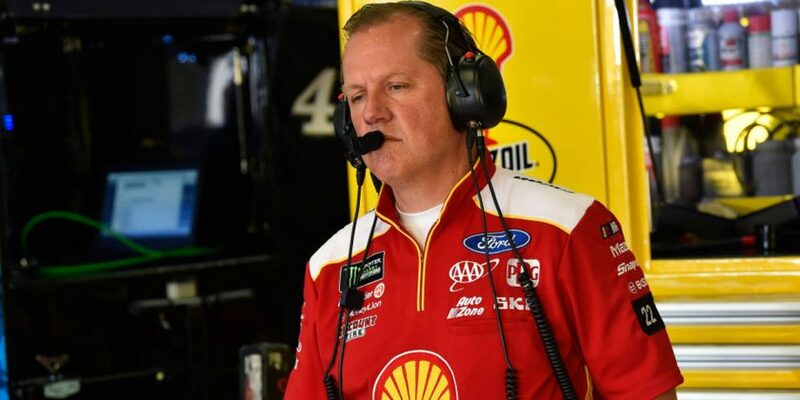 For every strategic decision Todd Gordon has gotten right for driver Joey Logano over the years, there’s one like Sunday he wishes he could get back. The defending championship-winning crew chief appeared on SiriusXM Radio on Monday morning to discuss the rationale behind his decision-making on Sunday afternoon in the Food City 500 at Bristol Motor Speedway. Logano was leading the race at the time of the final caution with 21 laps remaining. Gordon was faced with a dilemma. Does he call his driver into replace 40-lap old tires or maintain his track position, albeit on older tires for the final 15 laps. Gordon chose the former and Kyle Busch inherited the lead, something he would not relinquish. "We had been 33 laps on tires, thought we were going to have about 18 to go," Gordon said. "The sort out (of the lineup) afterwards took a bit longer than I thought so we had about 15 to go when we got done. … I was scanning the radios and (Busch) said (he) might stay out, but my concern was that if we and the 18 stayed out and everybody else behind us comes to get tires, then there’s tires lined up on the rows behind us. "I didn’t want to be that guy that stayed out and then got beat by tires behind us. It was a last-minute call. We had talked back and forth about whether to stay out or come for tires. I felt like if we stayed out, my opinion was we were going to see tires in row 2 and at worse in row 3 and it didn’t end up being that way. When we came off pit road, I think we ended up in row 4. "It’s just trying to anticipate what other crew chiefs are going to do with their cars is a gamble and a guess and as the leader, I think we had a really strong car, and everybody knew we had a strong car. I think at times people react to whatever decision you make and go the opposite way. If we stay out, I don’t know that everybody that stayed out stays out, but we’ll never know that and you try to make the decisions you can with the information you have at the time. Immediately once you see how many guys stayed out, it’s pretty evident maybe we should have made the other call." Logano ultimately finished third, having led 146 laps and winning the second stage. He felt he had the best car but didn’t place blame on Gordon. It was a zero-sum game. "It stinks when you have the fastest car and don’t win, but it’s a team sport and it takes every piece to make it work," Logano said. "We had the car part figured out today, we just missed it on some other ends and just have to keep fighting hard. We got a stage win and that was nice and led a lot of laps, but you want to win at Bristol so bad. Bristol is the coolest track. You see the start-finish line and think you’re going to get it, but things happen quick here." And Gordon has been around long enough to know that decision easily could have won them the race under a different set of circumstances. "In the future, do you make that call differently? I don’t know, " Gordon said. “You take the information you have at the time and make decisions from the information you’ve got. You’re never going to make every call right. People can second-guess what you do and where it goes and it’s very easy to sit back on Monday and say they should have run the ball instead of throwing it. "They’re reactionary calls. You can’t calculate every situation. In this one, could I have gone the other way? Yes. Was I all the way into the middle of 1 and 2 before I made the call for him to come because I was waffling on it? I got to the point where it was a 50-50 call in my head and when I get to 50-50 calls, I go for putting tires on because Joey is an awesome, aggressive driver and when we put him in those positions, he usually elevates."